We had two straight days of sunshine, which is rare for this time of year. 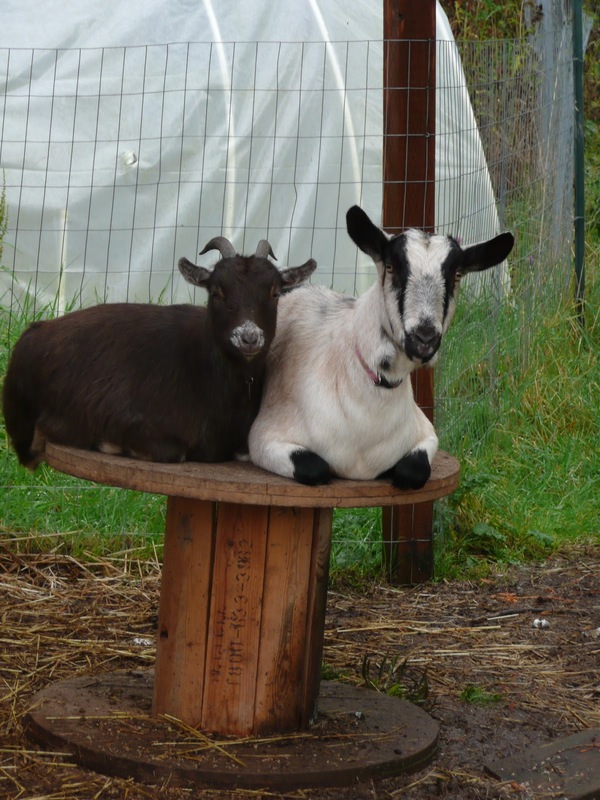 All the critters were loving it; the ducks spent all day in the pond, and the goats found a sunny spot perfect for napping. 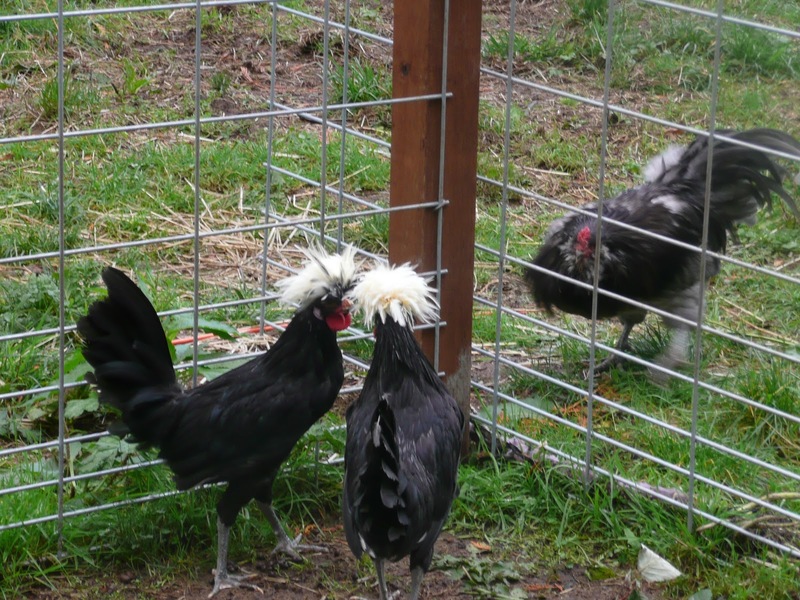 Since it wasn’t raining, we decided to let the two Polish roosters out for a romp in the pasture. They weren’t too sure about their new found freedom, especially when King Julian noticed them through the fence. They also needed a dedicated Christmas-minder, because for some reason the female turkey is not terribly friendly. Right before Gene put the metal grate across the A-frame, I heard a loud fuss and ran into the kennel to find the white Silkie hanging from Christmas’s beak. Now that they’ve been separated, she’s taken to hungrily staring through the kennel door. And don’t worry, the Silkie is fine. Although you can see him shudder whenever Christmas squawks. We also let Harvey and Claire out for a spin around the yard. Claire got about half a foot outside, looked around, then went back to her food bowl. Harvey, on the other hand, cruised all over the place. He can really move for such a roly-poly thing. He also required constant minding, since we didn’t want to have to fish him out from under the deck, or out of the brambles. At least we didn’t have to worry about predators with him, I don’t think even an eagle could carry him off. 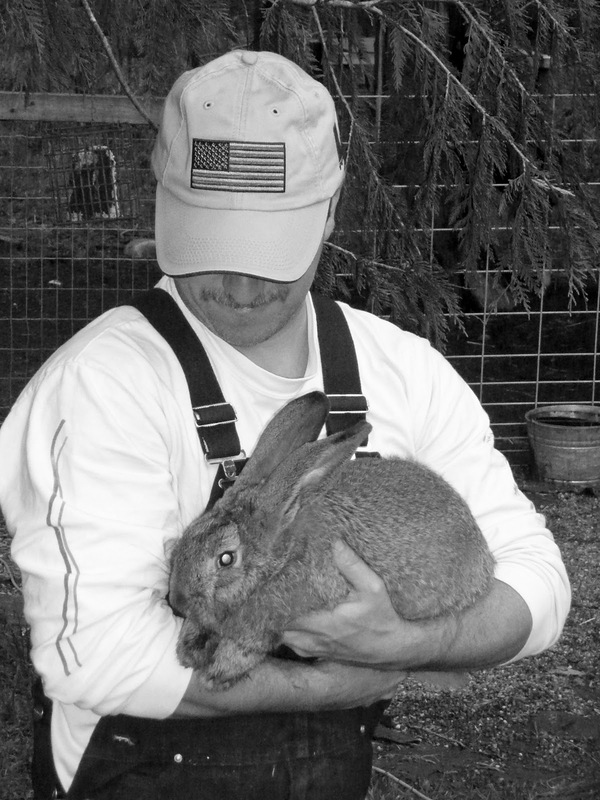 I know they’re big bunnies (Harvey is about ten pounds at only three months), but the amount of food they eat still amazes me. I can put half a bowl of cut grapes or mini carrots down, and by the time I get the door shut it’s pretty much devoured. I’m going to have to grow a lot of veggies in the greenhouse this winter, because they are quite accustomed to being presented with an array of fresh produce every day. Gene says I spoil them, but he says that about all the critters. Speaking of critters to spoil, exciting news! We got three new ducks! 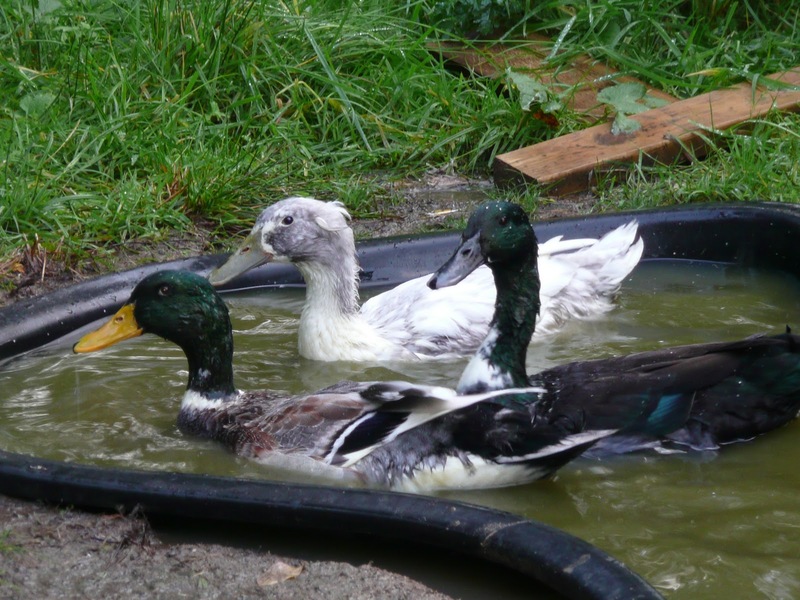 We (and by ‘we’, I mean ‘I’) decided that what the farm desperately needed was more ducks. I found three drakes for sale, which matches up perfectly with our three girls. We brought them home in apple crates. The Bedonkaduck, Paris, and Nikki were immediately intrigued, especially after I yelled, “Look! I have boxes full of boys!” The drakes, named Bear (because he survived a bear attack when he was three months old), Smudge, and Daffy, absolutely love their new home. They spent two solid days playing in the pond. When I went to check on them shortly after their arrival, a pool party was in full swing. All six of them were happily paddling around, and bikini tops were flying everywhere.